Violence has always been a contingency of American culture and it came with the 49ers. Despite the advances in mining brought by the Chilean the American 49er quickly targeted those from Chile who by now had taught the 48ers all they needed to know about extracting gold. No longer of any use Americans simply felt that California belonged to them and anyone not a U.S. citizen was in effect stealing their gold. The result being Americans commonly running non-Anglo’s from their claims. The situation only became worst by late 1849 when mining land had become scarce, and the easy “free gold” was gone. 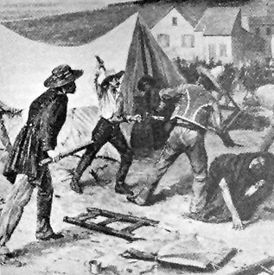 Unlike most non-Anglos in the diggings who simply remained passive and moved on when told to do so by the intruding Americans, the Chilenos were well educated, many of the initial Chilean 48ers came from well to do families, they were proud and quickly gained a reputation among Americans as fierce fighters who always stood their ground as equals when threatened by gringos. This perceived arrogance further frustrated the American miners who attacked Chileans with impunity. Murders, whippings, beatings, and mutilations became the Anglo way of dealing with these Spanish speaking communities. For this, the Chileans hated all Yankees and called them out as cowards. “Chileans and other aliens in the area had no better luck. While preparations were being made to welcome in the New Year at Calaveras with a bloody sacrifice (referring to the Battle of Chile Bar incident) similar things were going on in Stockton, Sonora, Hangtown, Sacramento, and in San Francisco to celebrate the holiday by mass violence against aliens. The brutal treatment of all non-English speaking folks of any color became a trademark of Gold Rush justice. Although racial hate crimes did occur the overwhelming majority of violence resulted from American miners who sought to remove the competition, regardless of race, first with a warning – then with force. Much like the Chinese the Chileans retreated from the mines many settling in San Francisco who went on to become successful businessmen. Others pursued politics becoming judges, legislators, and Congressmen, their families became among those prominent and wealthily in the new state. Beilharz, Edwin A. and Lopez, Carlos U.; We Were 49ers! ; Ward Ritchie Press; Pasadena, California, 1976. Boessenecker, John, Gold Dust & Gun Smoke; John Wiley & Sons, Inc.; New York, New York, 1999. Gernes, Phyllis L.; Hidden in the Chaparral, Self Published; Garden Valley, California, 1982. Holliday, J.S. ; The World Rushed In; Simon & Schuster, New York, New York, 1983. Hughey, Richard; Placerville and Vicinity – Part 9; Mountain Democrat, Placerville, California, November 23, 2001. Hughey, Richard; Hangtown: The Navarro Account; Mountain Democrat, Placerville, California, December. 7, 2001. Sioli, Paolo; History of El Dorado County; Cedar Ridge Publishing, Georgetown, California, 1998. About the Author: Anthony M. Belli is a native of California currently living in the Sierras of El Dorado County. Having a background in law enforcement, he was the youngest police chief in Oregon history. Now, Belli is a recognized historian, writer, and lecturer on the California Gold Rush, and serves on the research staff for the El Dorado County Museum. He has been featured in a number of television shows, writes for Lost Treasure Magazine, wrote the book Mysteries of Tahoe – Lost Treasure.